I received the best gift from a friend at work the other day. After this was first bought into my life I kept seeing it everywhere I went!... Seriously, it was haunting me. I was clearly meant to have one of them in my life. So you can only imagine my excitement when I walked into the office to find one on my desk... Squealing was involved. 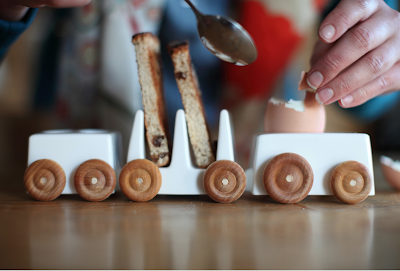 I, Carla Michelle Anne Leclezio am the proud owner of my very own Breakfast Express Train. 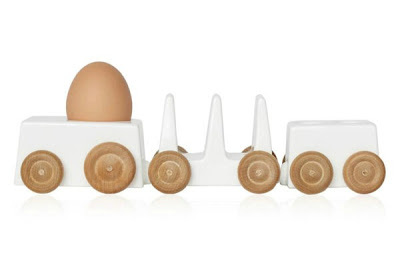 Yes... A train you eat your Breakfast off. Amazing no?! It comes in three parts, a carriage for your egg, a carriage for your soldiers and a carriage for your seasoning. The PERFECT device to carry your dippy egg breakfast. It's made out of bone china with magnets that connect the three carriages and real working wooden wheels that will guarantee you have a wheely eggciting (sorry) time over breakfast. Unfortunately it's quite an egg-stravagent (last time promise) purchase at £60 but sure to provide hours of entertainment over the breakfast table! A beautiful creation by Reiko Kaneko, who I have fallen in love with recently, her table wear is to die for! Check out her website ... www.reikokaneko.co.uk, but beware, you'll probably want to buy pretty much everything on it. I warned you!